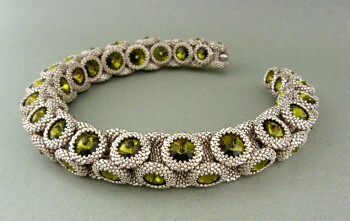 This necklace is formed of 42 individually beaded segments and contains 84 rivolis. It was inspired by the idea of pieces of beadwork which would interlock with each other and be interchangeable to create different looks. You can see a bangle variation of this piece here and beaded beads here.